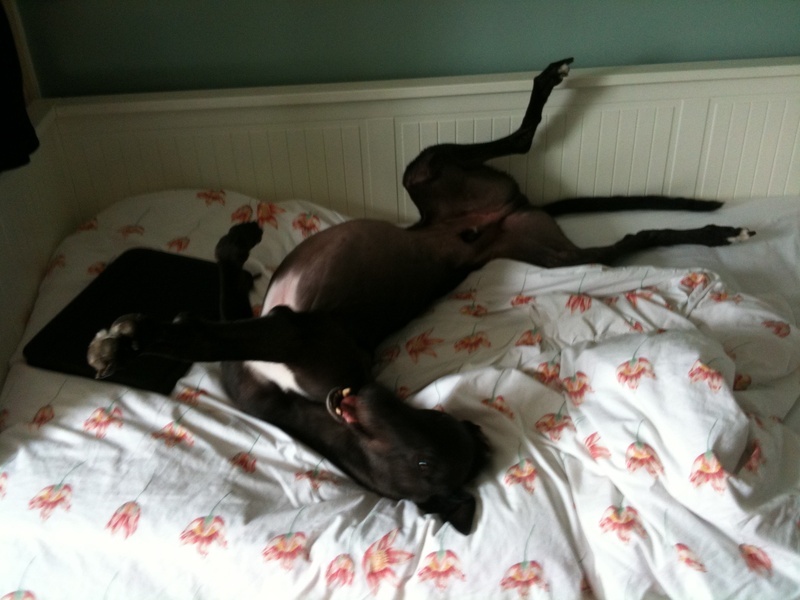 Eddie is the biggest handsomest black greyhound you could ever wish to meet, this is what his Mum thinks of him: Just to let you know how the big softy is doing. He's starting to chill out even more! He's stopped following me round the house and has taken to sleeping the day away on the sofa in the front room. He's got so many comedy moments: putting his paws on my shoulders while he lies next to me on the sofa to alert me to the fact it's food time; skipping, hopping, bouncing and bowing to play with us and taking our shoes and hiding them in his bed for safekeeping (unharmed!). He now sleeps on a duvet in the bedroom and waits like a small child for us to wake up. The minute there's a movement in the morning, he's asking to get on the bed for a cuddle with what I call his 'trilly roo'. He really can't get enough cuddling, dearest boy. So sad to think of him in a kennel. He eats everything you put in front of him and is a bit of a dustbin if you let him, without the usual greyhound bottom trouble! His teeth are great now as the sweetie lets me brush them (chicken-flavoured toothpaste is yum, apparently). He's put on 2kg, and the vet's very pleased with him. No more corn trouble: he's got much more muscly so maybe he is balancing better. He's certainly got harder pads all round, which must help. Recall is a bit of a mystery, so we have a harness and long lead for walks, which lets him say hello to other dogs and have a degree of independence. We've also been taking him to the safe field, where he happily sniffs around and doesn't seem to want to thunder about, so I think he's happy with his onlead walks for now. We're re-acquainting ourselves with Ashton Court and Leigh Woods and he's been a star with every single dog he's met: big bouncy ones, little yappy cross ones, nervous ones, stalky ones, irritating slobbery ones and nice ones of all shapes and sizes! His nervousness on walks in town is getting slowly better and he's now the proud wearer of a DAP collar, which I think helps. We can't imagine life without him. Thanks so much for such a wonderful boy. Black beauties rule!